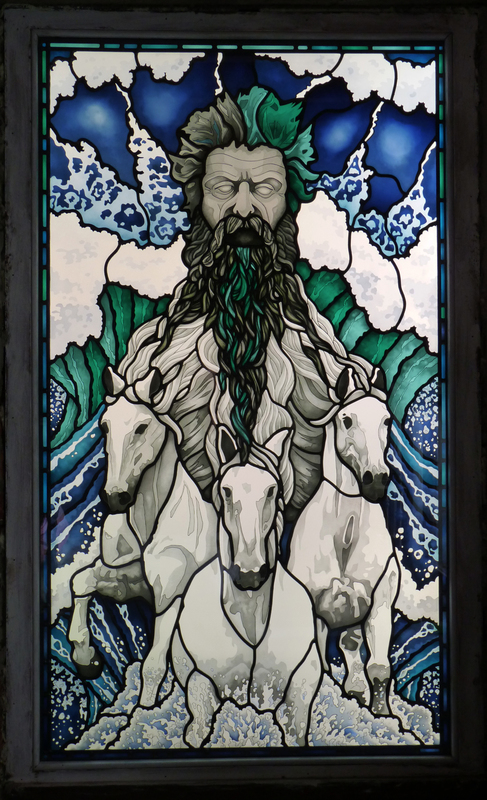 After a lengthy delay due to ongoing construction works, our Neptune stained glass window was finally installed last week at our clients property on the north west coast of England. Though the window was completed in September 2014, extensive ongoing ground-works and full scaffolding around the property unfortunately meant he had to be kept in secure storage in a specially made crate for over 12 months. Having spent in excess of 6 months producing the panel throughout 2014, having unpacked him it was a little like saying hello to an old friend again! The panel was installed against a sheet of satin etched glass to minimise visual disruption from the many trees and stone walls directly behind in the properties garden. Initial concerns about the amount of light transmitted throught the window proved to be unfounded as we felt both the brightness and contrast of the piece were actually lit perfectly. An LED floodlight will also be installed to allow the window to be back lit at night. Now taking pride of place in our clients dining room alongside a beautifully made arts and crafts period nautically themed fire-place, both ourselves and our client are incredibly pleased with the final result of a commission we can truly term a labour of love.